WHEN LIFE HANDS YOU LEMONS, SHUT UP AND FISH! You ever had one of those fishing trips where everything seems to go wrong? I had one of those days yesterday. To begin with, it was hotter than Hades and all I wanted to do was escape to the mountains in my car while cranking the AC. So at 2:00 p.m., I grabbed my fly rod and loaded up my French Brittany Sunny Girl and we headed for the hills. However, as I drove up the canyon dirt road to get to my destination, my Honda CRV started overheating. I bought this car back in April because my “trusty” Subaru Legacy wagon blew a head gasket, which, as a result, caused it to overheat. I thought to myself: Here we go again! I turned off the AC and turned on the heater (in the 95 degree weather, mind you) and the temperature needle dropped immediately, but admittedly, the car trouble put a little damper on the excursion. 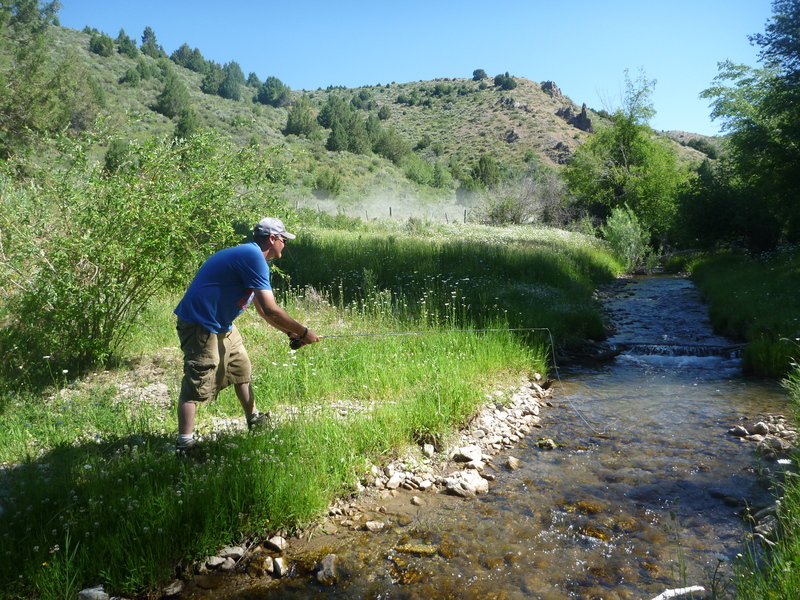 Brother Jake fishes Trickle Creek during the Summer of 2012. Upon reaching my destination, a tiny creek I lovingly call, “Trickle Creek,” I decided that since I was here, I was going to fish anyway. I put together my four piece, TFO, 3 weight rod, which is perfect for this little stream, and then realized that the reel was at home in my backpack. “Dumb Dora!” My first impression was to call it quits and get while the getting was good. But I looked through the back of the car and spied a 5 Weight Orvis Clearwater Reel and threw that on. This ought to be interesting, I thought to myself. With the oversized line strung through the rod, I tied on a Chubby Mormon Girl, which is a fly tied by my brother, Shawn. Regarding its name, I think brother Shawn should have a little more respect for his roots. But I will say that the crazy foam fly is perfect for western waters as it could represent a Yellow Sally, a stone fly, or a grasshopper. The cutthroat of Trickle Creek went after the fly like gang busters, but, to my chagrin, I kept missing them. “Man, I am stinking up this joint!” I exclaimed in frustration as I wiped the sweat from my brow. After missing five fish in a row, I realized something had to be wrong. So I pulled the fly up to my eyes and noticed that the very tip of the hook was busted clean off! Argggh! It was as if the elements were conspiring against my humble desire to catch a fish. I disgustedly clipped off the fly and looked through my fly box for something to fix this fiasco of a fishing trip. I tied on a Yellow PMX too big for this water and drove down the road to some other prime stretches of the creek. Without the AC on the car did fine. So my attitude improved some. I parked, climbed a barbwire fence, and fished some of my favorite holes and, despite the oversized PMX, the Cutties attacked it with a vengeance. Soon fish started coming to hand regularly and my earlier stress began to dissipate. It was so hot that Sunny Girl mostly watched me fish while laying in the stream, which looked refreshing and tempting. Yellowstone Cutthroat are simply beautiful. After busting the PMX off on an overhanging tree, I tied on a “Mother Chukar,” a fly much like a Stimulator tied with chukar feathers and legs in the shape of an X (I know, I know, this fly’s name is as bad as the Chubby Mormon Girl, but I didn’t make it up!). In one particular plunge pool, I cast my fly, a large fish pounced on it, and I stung him but missed. I thought: That’s it for this fish and this pool. Notwithstanding, I gave it one last token cast and, against the odds, the big fish just couldn’t resist. 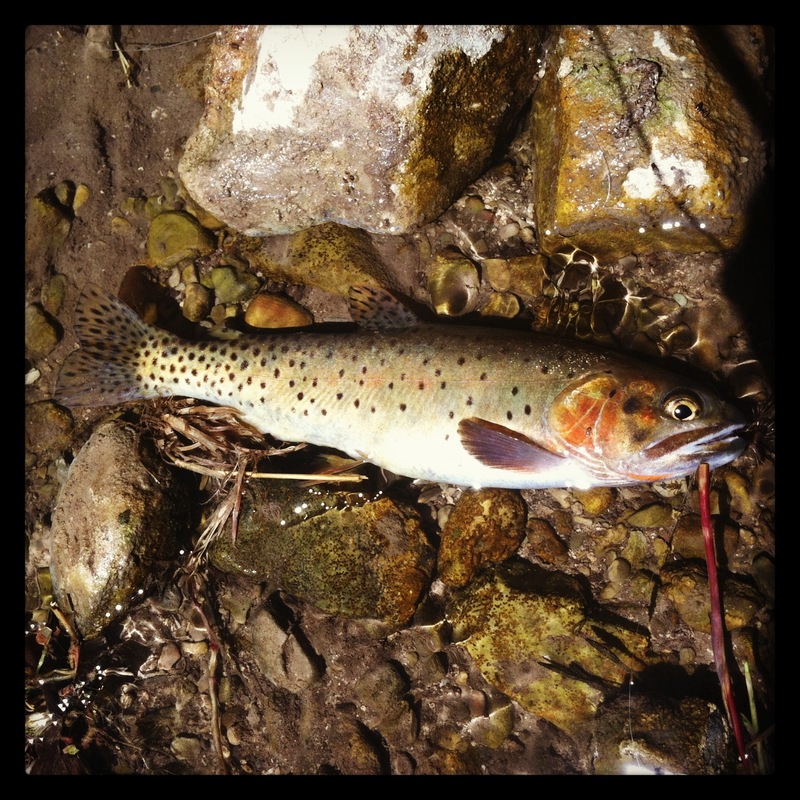 Upon landing this beauty, I realized that this was the biggest fish I had ever seen from Trickle Creek. When the time came to head home, my whole attitude had improved significantly. The big beautiful cutthroat from Trickle Creek. And so it is with fishing. Through all the little setbacks on this fishing trip, I learned an important lesson: Every single second we fishermen spend on the water is a gift and our attitudes should reflect this. So when life hands you lemons on a trout stream, shut up and fish! Thanks for stopping by. 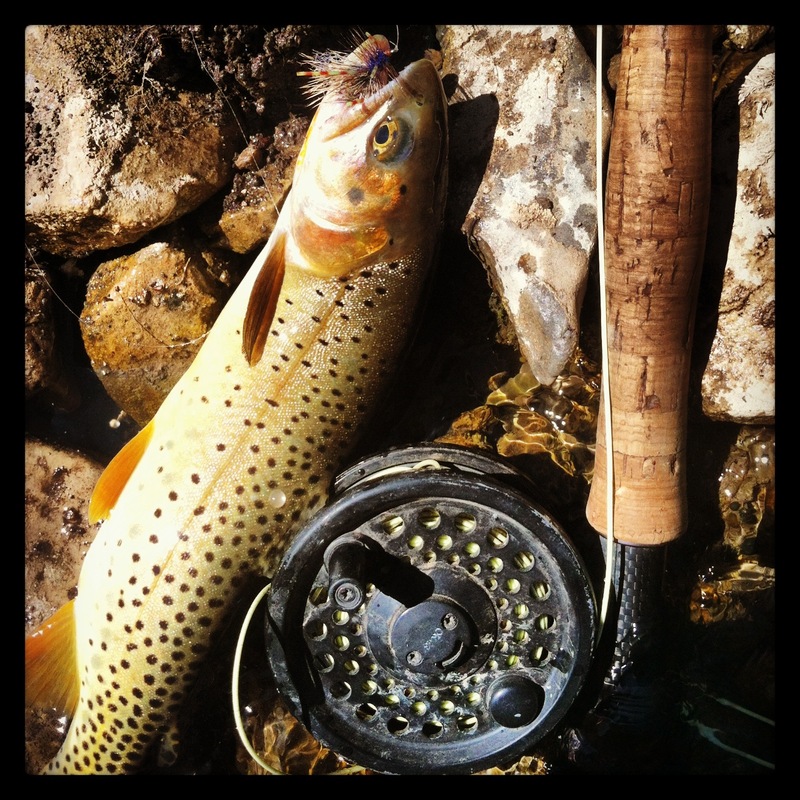 If you like this post, check out my book: Heaven on Earth: Stories of Fly Fishing, Fun & Faith. I’m sure you’ll love it! Here here! Loved it Andy! So true. Dodging hot water and stormwater runoff out east. Summer can be amazing or frustrating…depending on what you let it be.